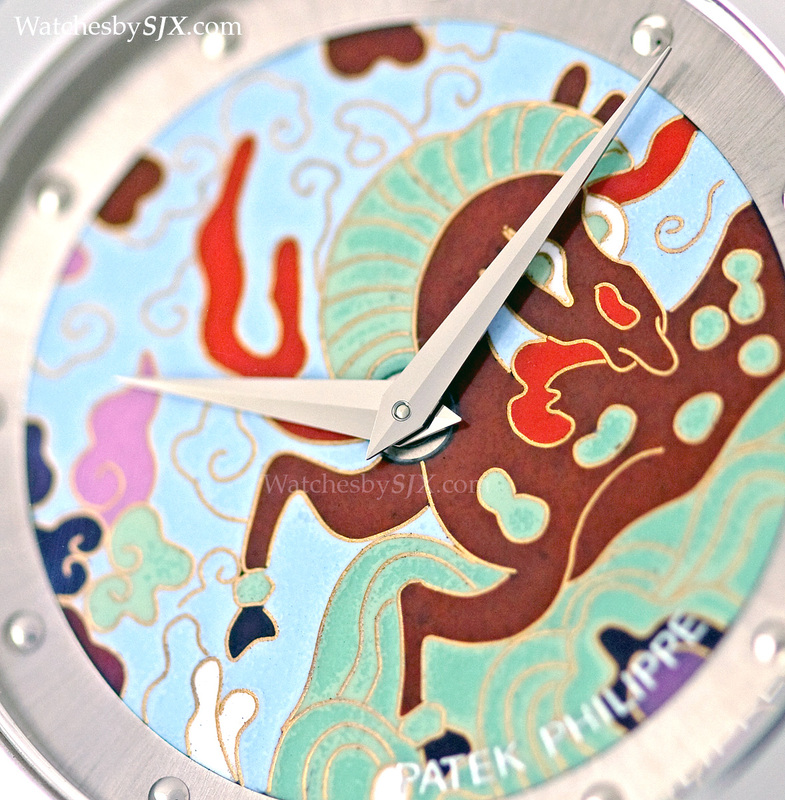 Each year Patek Philippe creates a limited edition quartet of Calatrava wristwatches with dials decorated with enamel, marquetry or crafts. 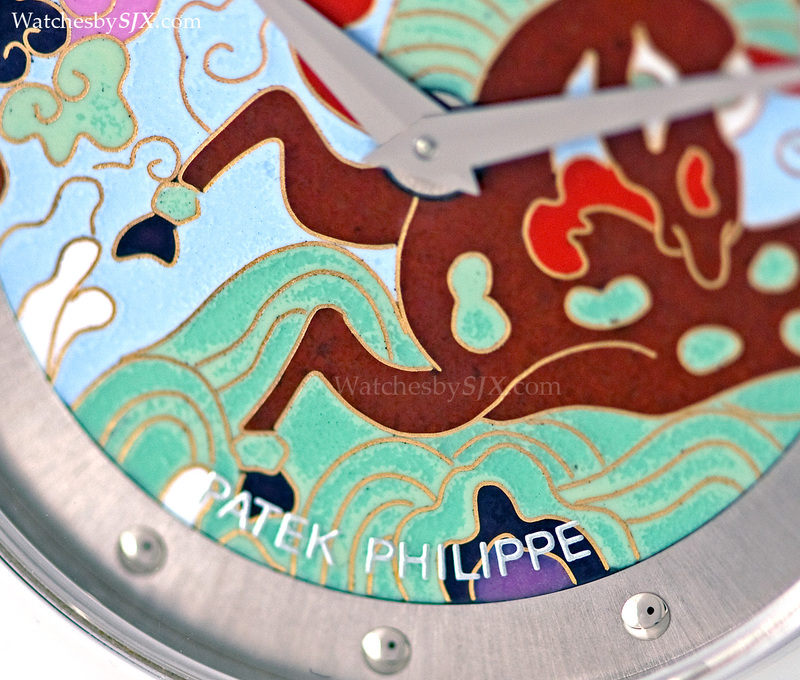 To mark the Chinese Lunar New Year of the Horse, here’s a close-up look at the Patek Philippe ref. 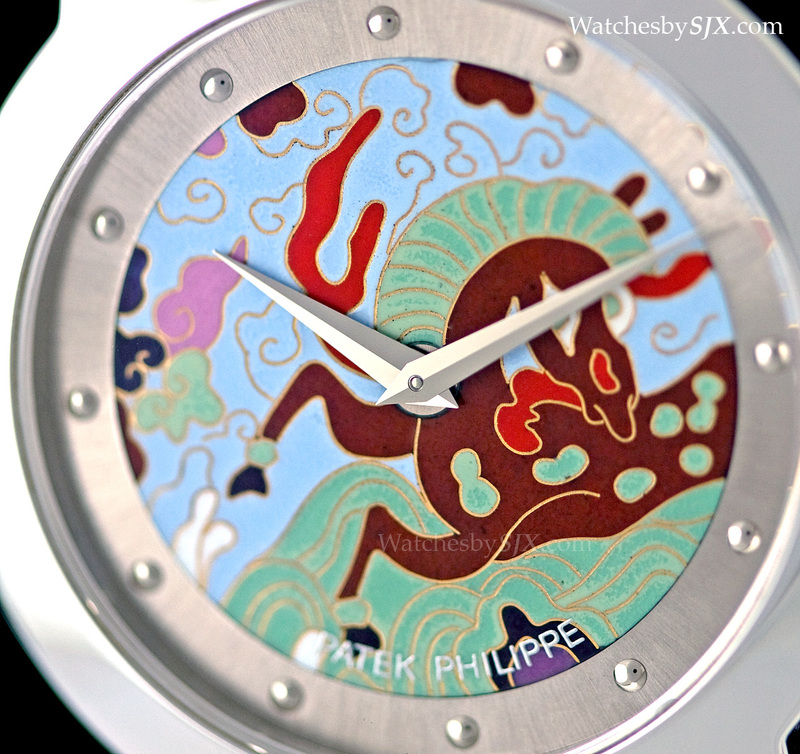 5075G cloisonné enamel “Horse”. Starting in 2000, Patek Philippe has created annual limited edition sets of four Calatrava watches with special dials, often in enamel. Made in 2002, this particular ref. 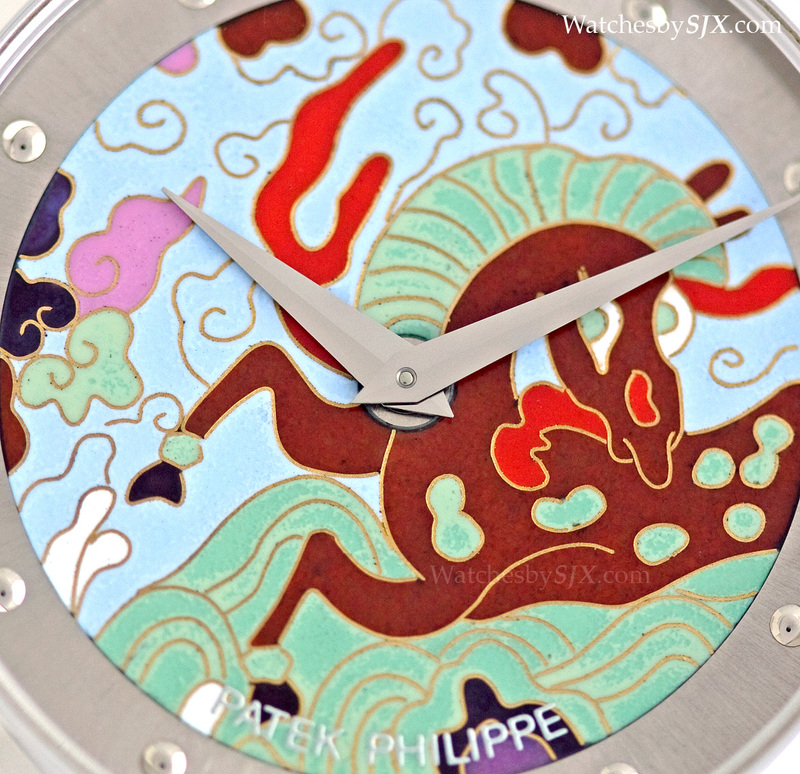 5075G with a cloisonné enamel dial was from an edition inspired by a nineteenth century Qing Dynastry cloisonné bowl. Only three sets of this edition were made. 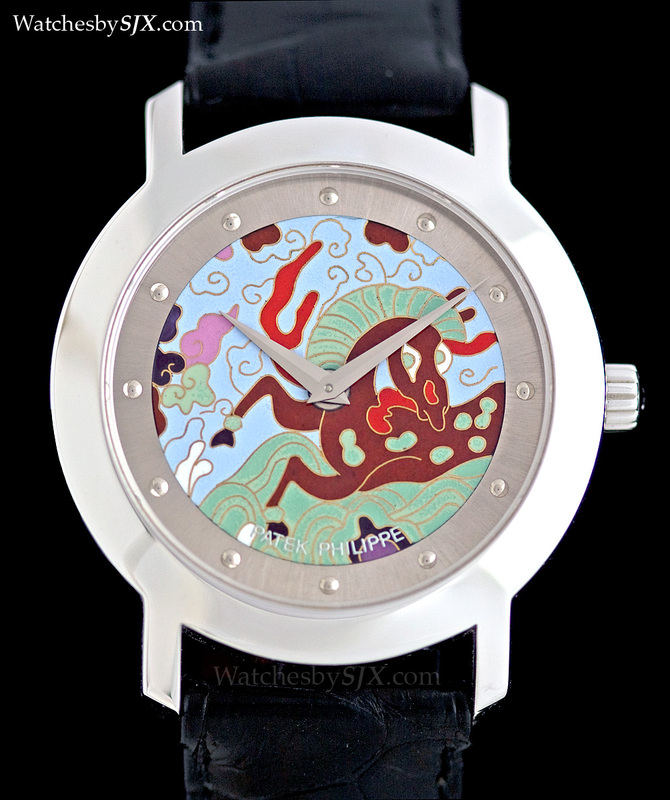 Like all the other enamel limited editions, this ref. 5075G is a simple timepiece. The case is devoid of ornamentation, without even a separate bezel, equipped with an ordinary cal. 240. 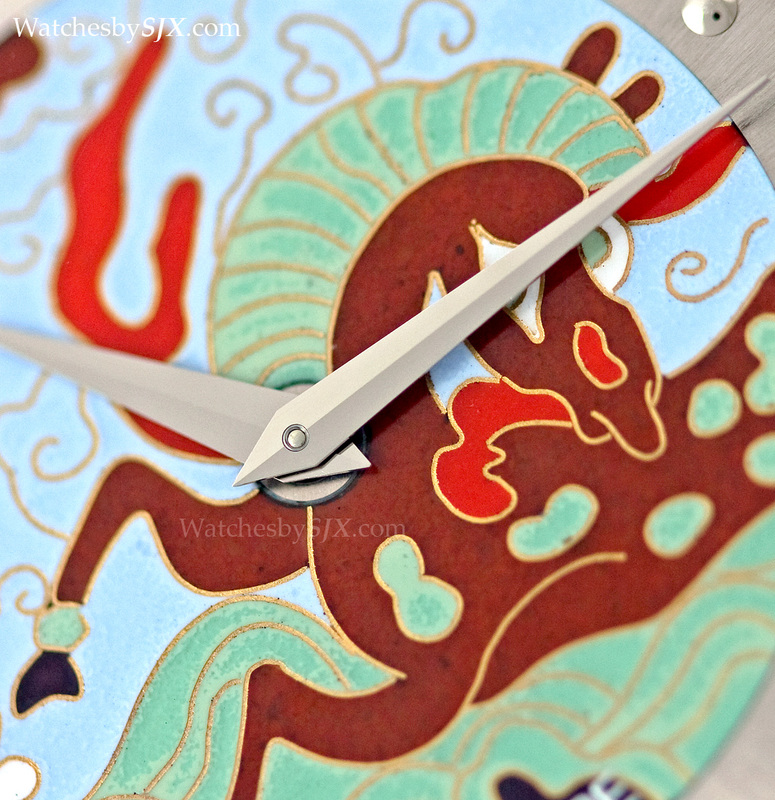 The dial has dauphine hands and spherical hour markers on the brushed chapter ring, with its central portion being a polychrome cloisonné enamel disc depicting a horse in a typically Chinese form. 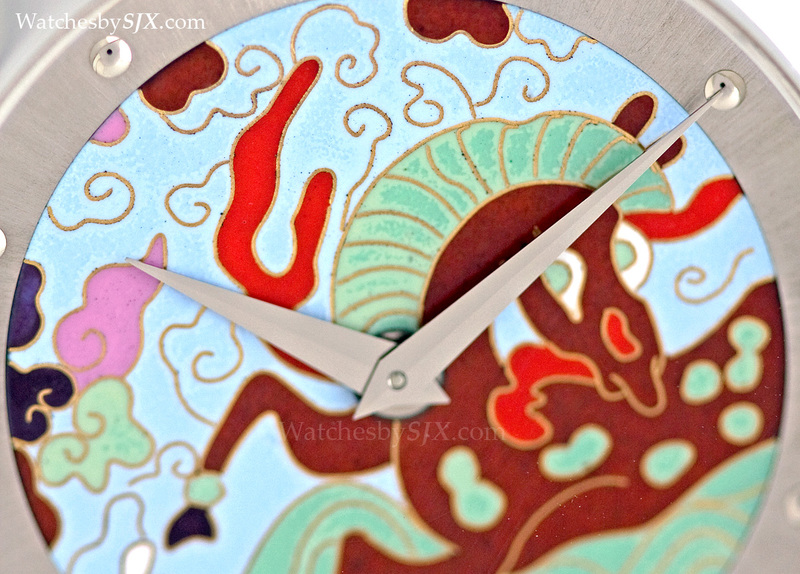 Richly coloured with finely formed gold wires, the cloisonné dial is beautifully executed. The dial quality is exemplary. Notably, this dial (and all the others in this series) is visibly superior to the cloisonné dials of the Patek Philippe ref. 5131 world time watches. 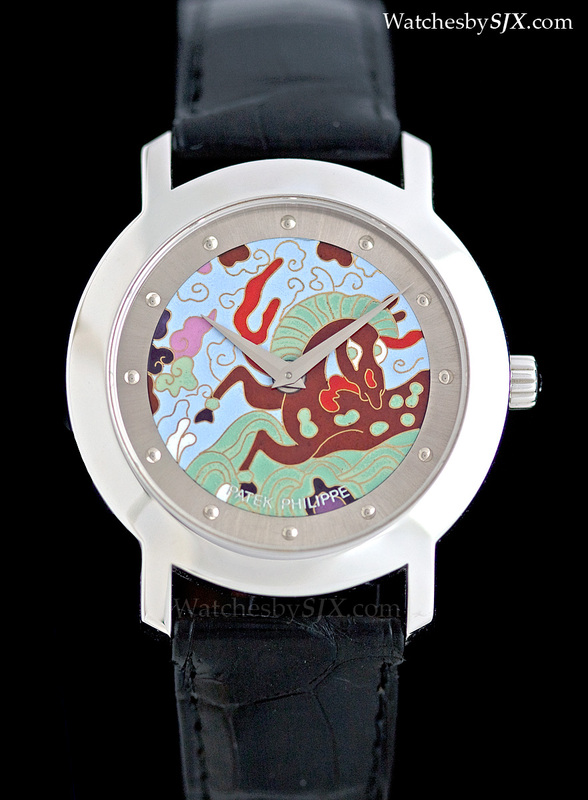 Worth examining for the sake of comparison is the Hermes Rocabar, which feature cloisonné dials made by Anita Porchet. 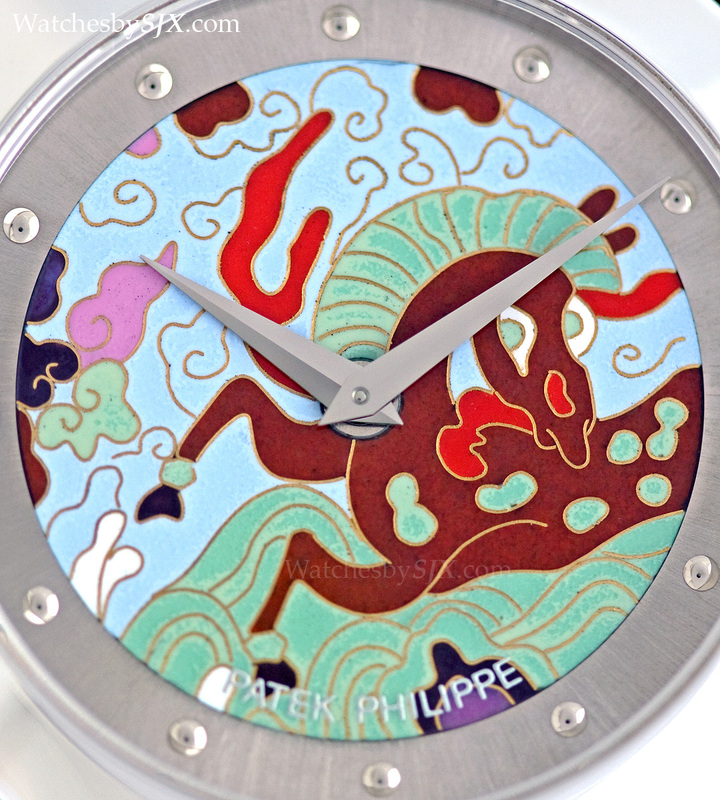 Ms Porchet’s work for the Hermes demonstrate better enamelling technique with less imperfections in the enamel, but this Patek has much finer shaping and application of the gold wires for the motif. These enamel Calatravas typically sell for US$150,000 or thereabouts at auction, which is similar to their original retail price. This makes them exceptionally expensive, but they are rare and beautiful. Here’s wishing all our Chinese readers a prosperous Lunar New Year! LVMH just posted its results for 2013, showing slow growth overall. Sales at its watch and jewellery division were flat, though profit was up. The world’s largest luxury group LVMH Moët Hennessy Louis Vuitton saw revenues rise 4% in 2013, a slowdown after years of double digit growth. Its best performing division, and the only one with double digit growth, was duty free retailer DFS, which saw sales rise 13%. Watch and jewellery sales fell 2% on an actual basis, but rose 4% based on constant exchange rates, meaning sales were essentially flat. Nonetheless, profit at the watch and jewellery division, which mainly comprises Bulgari, TAG Heuer, Hublot and Zenith, was up 12% compared to the year before. These results come just a few days after a management shake-up at its watch and jewellery division. These figures provide some evidence that after years of strong growth, the slowdown in luxury watchmaking is upon the industry, as discussed in our editorial, “Are watches too expensive?“. More details on its 2013 financials are available from LVMH.